New. B000FS9FCG Ships pronto! Brand new and ships pronto! New. 140120841X BRAND NEW, GIFT QUALITY! NOT OVERSTOCKS OR MARKED UP REMAINDERS! DIRECT FROM THE PUBLISHER! |0.92. Lloyd, David. New. Trade paperback (US). Glued binding. 288 p. Contains: Illustrations, black & white, Illustrations, color. Lloyd, David. New. 100% Money Back Guarantee. Brand New, Perfect Condition. We offer expedited shipping to all US locations. Over 3, 000, 000 happy customers. Trade paperback (US). Glued binding. 288 p. Contains: Illustrations, black & white, Illustrations, color. This item shipped and arrived quickly. The price was awesome and also was in perfect condition. Highly recommend. The world seems to get ever closer to Moore's vision. Well written and illustrated. The story is gripping, thought-provoking, and dark. Definitely for an adult audience. Although, I'm not usually a fan of graphic novels, Alan Moore seems to have a gift. 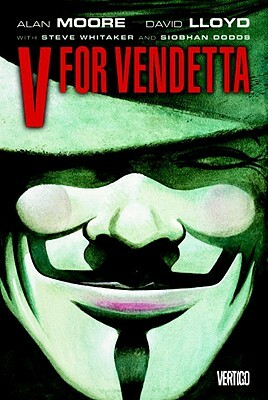 V For Vendetta is profound and insightful and truly gripping. It's an incredible read with great characters and an amazing storyline. It makes you really think about anarchy and society at the prompting of a Zorro-esque Guy Fawkes hero. Evie is a blonde teenager driven to desperate measures when she is saved by the mysterious V. This is a great graphic novel and interesting. There are no thought bubbles. Instead readers must pay attention to facial expression and dialogue. Its also a great interpretation of an economical crash and a goverment turned dictatorship. The Word War 2 references run throughout the story. What is the best part is V's relationship with Evie. Since there are no thought bubbles their relationship is left as mysterious and complex as the characters. It leaves it up to the readers if there is any romance between the two.